The TRR is located in the extreme Northwest corner of Wisconsin and extends through the iron ore range of Minnesota to the Canadian border. Iron ore moves to the Twin Ports of Duluth , MN and Superior, WI. In addition to iron ore, grain from the Great Plains of the USA and Cabada and coal from the mines in Powder River basin of Wyoming move to the Twin Ports for loading into boats at Duluth and Superior, the western most ports of the Great Lakes. 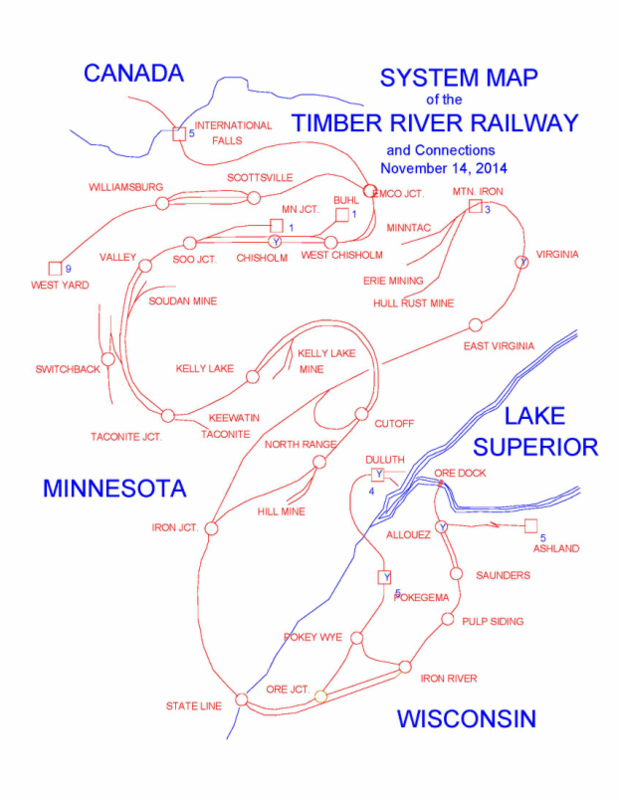 It connects with the CN/DWP at International Falls, the Milwaukee Road at Soo Junction and the Burlington Northern and Duluth, Missabe and Iron Range at the Twin-Ports and throughout the Iron Range. In addition to the huge ore dock at South Allouez there is a new unloading facility at Duluth - the Duluth Mineral and Energy terminal - DMET..